The 2017 Acadia is all new, but built on nearly a decade of success in the midsize crossover segment. The new model is loaded with active safety features and one new innovation that makes perfect sense for a family vehicle. GMC calls it a rear seat reminder. "Too many children are inadvertently left behind in vehicles, often with tragic results," said Mark Reuss, General Motors Executive Vice President, global product development. "This system does not detect the presence of a child in the backseat, but it provides a simple, extra reminder for the driver to look in the rear seat on the way out of the vehicle, regardless of what may be back there," Reuss said. The safety feature could be expanded to other GMC vehicles and GM brands in the future, according to Reuss. It is standard equipment on the 2017 Acadia, according to Duncan Alred, GMC VP of sales and marketing. "It's a simple device," Alred said. "It knows when the rear door has been opened, something's been placed in and then when it's not opened again at the end of the journey, it gives you an alert to that effect." 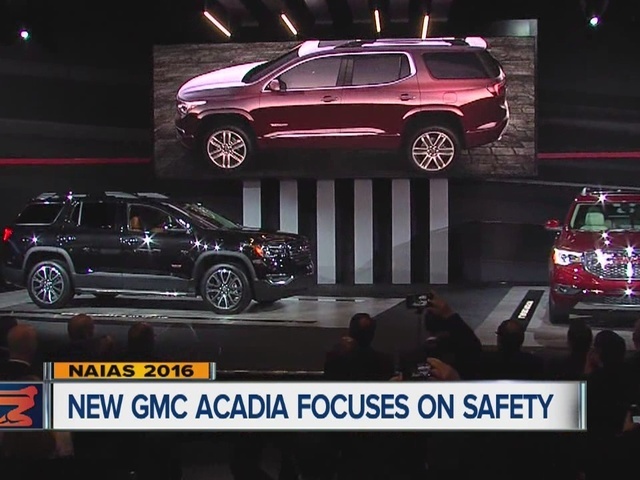 2015 was Acadia's best year ever with 96,393 vehicles sold. The new version is smaller and more car-like. It is also 700 pounds lighter than the model it replaces.